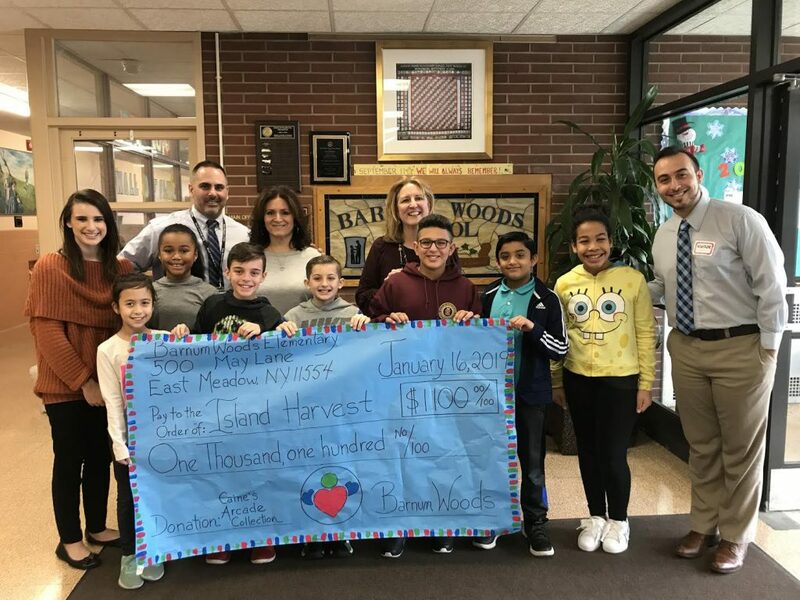 Through the creation of arcade games, East Meadow’s Barnum Woods Elementary School fifth-graders were able to raise $1,100 to donate to Island Harvest. Fifth-graders at Barnum Woods for the third straight year used the idea to carry out a monthlong creation of arcade games made of recycled cardboard and materials. Some examples of the games that students created included foosball, Plinko, pinball and claw machines. Parents, students and staff were invited to come and play for 25 cents per game on Dec. 17, with all money raised going to Island Harvest. On Jan. 16, representatives from Island Harvest came to Barnum Woods to collect the donation and to thank the students for their efforts. Photo caption: Fifth-grade students from Barnum Woods helped to create a donation of $1,100 to Island Harvest through the Global Cardboard Challenge inspired by Caine’s Arcade.